Get off the road and experience our wilderness! We are known for our breathtaking sunrises. Wabaskang Lake is over 15,000 acres of water with approximately 105 miles of shoreline to explore. Wabaskang is a fairly big lake (at least by U.S. standards) that “fishes small”. CLICK HERE to view map of Wabaskang Lake! Wabaskang Lake is not one of those lakes that only has quality fishing in three or four places. There are easily DOZENS of great fishing spots very close to camp that guests can fish, CATCH good numbers of fish and do it while not “fighting” for position with 10 other boats. Not having another camp within 10 miles definitely has it’s advantages! Wabaskang Lake is located 40 miles north of Vermilion Bay, Ontario on Red Lake Road. 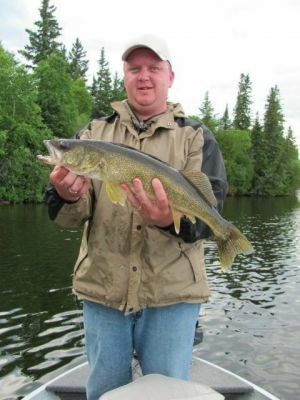 Well respected in NW Ontario, Wabaskang Lake is a consistent fishery for Walleye, Northern pike, Smallmouth bass, Jumbo perch, Lake trout and Whitefish. Wabaskang is an easy lake to fish, and yields good numbers of healthy “eater” fish and provides everyone a legitimate opportunity at trophy fish of all species. In short, Wabaskang is an excellent multi-species fishery that is sure to please! A typical Canadian shield lake, Wabaskang has a wide assortment of rocky shoals, sunken islands, weed beds, points, islands and wind-protected bays, to make your fishing options endless. The many islands and bays make even the windiest of days easier to fish. The maximum depth of the lake is over 90 feet, however, the average depth is about 20 feet. The water is moderately stained making the lake a very productive fishery for all species. No Canadian fishing trip would be complete without a tasty shore lunch of freshly caught fish from the cool, clear waters of Wabaskang Lake. There are many island or shoreline spots to enjoy your shore lunch around the lake. We provide your shore lunch kit. Although there is a lot of water to explore, you won’t have to travel far from camp to locate and catch fish. 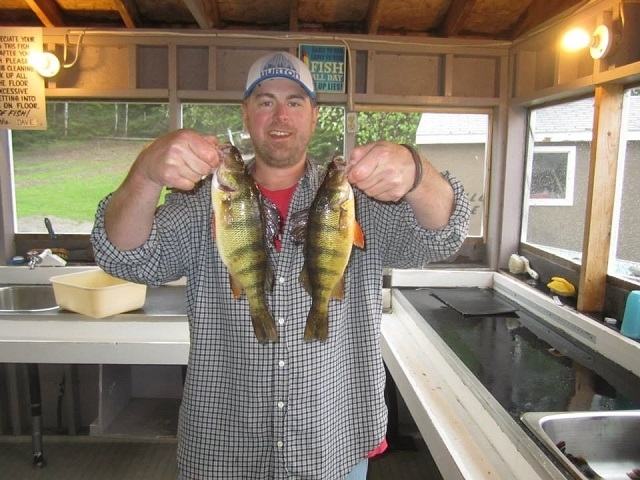 Dozens of excellent fishing spots are within a 10 minute boat ride from camp. Many first time guests have commented how quickly they were able to locate and start catching fish their first day in camp. Our guests spend their time fishing not going for long boat rides! Lake maps are available in the main lodge and will be marked to show you many of the quality fishing locations for all species of fish upon your arrival at camp. But beyond just marking a map for you, I will give you a complete rundown on the specifics to ensure that you will catch fish. What spots have been productive, what depth of water are fish biting, what baits have been working, what presentation methods have been effective (i.e. jigging, trolling etc). I will show you how to rig (if requested) and do everything I can to put you on fish! 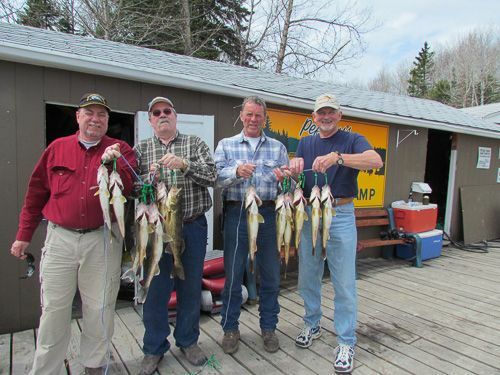 At Peffley’s Canadian Wilderness Camp, whether you are a first time guest or one of our many 20 year+ veterans of camp, you can be your own guide and be confident that you WILL catch fish!